A cleanroom is an enclosure that has a very low level of airborne microbes, vapors, dust or other pollutants. Cleanrooms are used for micro-systems production, pharmaceutical preparations, precision measuring tools enclosures or for various jobs such as data retrieval from hard disks. These rooms are kept “clean” with the help of HEPA or ULPA filters. All laminar air flow filters are built from stainless steel, in order to avoid particles from the material to enter the atmosphere. Cleanroom accessories provide more control over the humidity levels, contamination, microorganisms or other operating conditions that are critical for the respective process or technology. Such accessories include but are not limited to: flexible panels and strip shields, cleanroom doors, air conditioning modules, air handlers, air curtains, ultrasonic dehumidifiers. Environmental monitors are also extremely useful, as they allow 24/7 observation and control of the air purity inside the cleanroom. Talk-through wall communication systems are also very effective, because they are fairly inexpensive and allow for a clean through-wall communication. If needed, your cleanroom can come with fire safety systems installed, already integrated into a water sprinkler or another kind of fire suppression system. Depending on the specific task that needs to be performed inside, cleanrooms are classified according to the size and number of particles that are allowed to be found in a volume of air. The number of particles is counted with the help of a light-scattering instrument. It can determine how many particles bigger than a specified size are in the air at various sampling locations. There are two standards of classification: FED-STD-209E and ISO equivalent. There is a direct correspondence between the two systems. For instance, a Class 1,000 cleanroom is equivalent to an ISO 6 cleanroom, Class 10,000 corresponds to ISO 7 and Class 100,000 to ISO 8. Although the FED-STD-209E classification system was officially canceled in 2001, it is still used on a large scale, therefore many companies would use both systems to define specific cleanroom requirements. Tables that detail the correspondence are widely available online or in industry-specific publications. 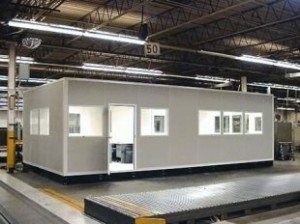 Whenever possible, it’s more effective to install a modular clean room, because it comes at a lower price, it requires no external ceiling support and it can be very easily planed and customized to match the exact configuration needed. Modular cleanrooms can be significantly less expensive than hardwall ones. Their main advantage is that they already include a return air chase system, which would otherwise be quite expensive and cumbersome to build. This also means that the building and installation time is shorter, since the modular walls already integrate some of the components. Such cleanrooms are fully compliant with the industry standards and cleanliness requirements. All panels, doors, drop ceilings and windows are chosen from the factory to meet your requirements, no matter if you need a Class 1,000 cleanroom, a Class 10,000 cleanroom. 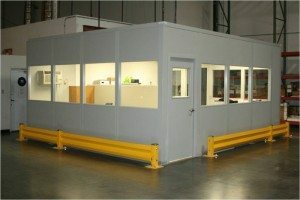 Cleanroom modules can be made from various materials. The main structure that holds the entire assembly is made from steel. All specialty components such as HEPA fan filter units, sealed and gasketed light fixtures or cleanroom drop ceilings are available at any time, therefore they can be delivered extremely fast, whenever needed, in the quantities you need. Even customers who already have a mechanical contractor can benefit from this, as we can supply your contractor directly all information needed for your HVAC system. Panel Built is the place to go if you want to build a cleanroom that’s customized to fit your specific requests. We do have well-trained experts and skilled workers who will take care of everything for you, at each step of the production, in order to make sure you have a perfect cleanroom, ready to be used, in the shortest possible time. Our specialists are ready to give you assistance with all information you require, in order to define your modular cleanroom specifications in as much detail as possible. You’ll then get a quote from us on your job. You may address our technicians at any time, with any additional inquiry you may have. They will be happy to answer all your questions in a prompt and professional manner by clicking here.